We like out fajitas saucy and smoky with a little bit of heat. These Barbecued Shrimp Fajitas won't disappoint. Stuffed with grilled peppers, onions and shrimp, these fajitas are finished with cheese and your favourite toppings. Cut 2 peppers and an onion into thin strips and marinate with about a pound of shrimp (16 pieces) in KRAFT Original Barbecue Sauce for 5 minutes. Barbecue shrimp and veggies in a stir-fry basket over medium high heat for 5 minutes or until cooked. 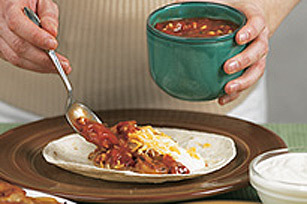 Spoon mixture into warmed, large flour tortillas, add KRAFT Double Cheddar Shredded Cheese, sour cream and salsa and roll up.